What an absolute delight; my first purple sprouting broccoli of the year. 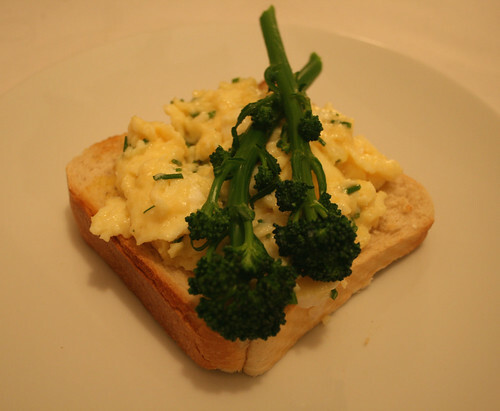 I picked it up from my local farm shop today and combined it with softly scrambled duck eggs and chives on toast for a late afternoon snack, washed down with a chilled glass of Sauvignon Blanc. An embodiment of Spring in one meal. The mildly onion flavour of the chives balances out the rich duck eggs and the deliciously fresh tasting purple sprouting broccoli gives contrasting texture, having been blanched in boiling water for just a few minutes. A very light sprinkling of sea salt brings out the broccoli’s flavour. This dish is perfect evidence that good quality, seasonal ingredients need only be cooked in the simplest of ways for stunning results. 1. Lightly combine the duck eggs with a fork and add in a pinch each of white pepper and sea salt. Start toasting the bread and put some water on to boil for the broccoli. 2. Gently heat a knob of butter until it melts then add in the eggs. Cook over a low heat, stirring until the eggs scramble. Keep them fairly liquid and take them off the heat just before done, as they will carry on cooking for a while. 3. 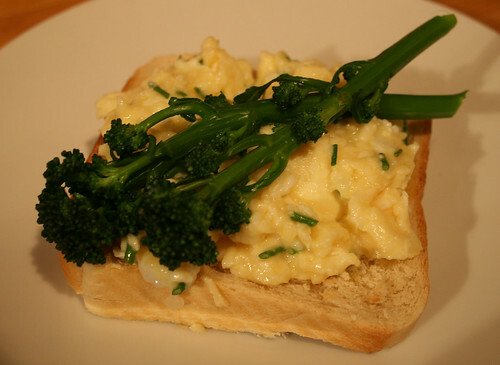 Snip some chives and lightly sir them into the eggs. 4. Boil the broccoli for a couple of minutes then remove from the water immediately. 5. Butter the toast and pour over the eggs. Top with the broccoli and sprinkle over a little more sea salt. Previous Post In the Bag: Cooking the Month of February!